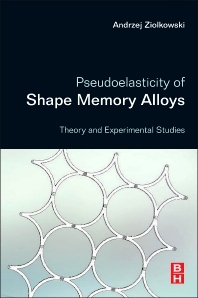 Pseudoelasticity of Shape Memory Alloys: Theory and Experimental Studies is devoted to the phenomenon of pseudoelasticity (superelasticity) exhibited by shape memory alloy materials. It provides extensive introductory content on the state-of-the-art in the field, including SMA materials development, definition of shape memory effects, and discussions on where shape memory behavior is found in various engineering application areas. The book features a survey of modeling approaches targeted at reliable prediction of SMA materials’ behavior on different scales of observation, including atomistic, microscopic, mezoscopic, and macroscopic. Researchers and graduate students will find detailed information on the modern methodologies used in the process of building constitutive models of advanced materials exhibiting complex behavior. Materials scientists and engineers, mechanical engineers, bioengineers, aerospace engineers and physical metallurgists. Andrzej Ziółkowski is an associate professor at the Institute of Fundamental Technological Research, Polish Academy of Sciences, Warsaw, Poland. He was awarded his PhD degree by the Scientific Council of the Institute of Fundamental Technological Research, Polish Academy of Sciences - IPPT PAN, for work devoted to “Problems in pseudoelasticity of shape memory alloys” and was awarded a postdoctoral degree of qualification for associate professor for his dissertation “Pseudoelasticity of shape memory alloys, experimental studies and theoretical description” (2007). His research interests are in continuum mechanics and thermodynamics, solid-solid phase transitions, special materials constitutive modeling, smart materials, unconventional energy sources. Dr. Ziółkowski's scientific publications are chiefly devoted to different aspects of shape memory alloys behavior. He was co-organizer of a Shape Memory Alloys Workshop and has been a member of the scientific committee of Symposiums, Shape Memory Materials for Smart Systems at the E-MRS Fall Meeting Conferences in Warsaw in 2005 and 2007. He is author and co-author of about 20 original scientific papers devoted to shape memory alloys.